GPS is great!… Most of the time. Having problems with GPS jamming? Pegasus Technologies, Inc. has developed a unique and effective solution that allows a stolen vehicle or asset to be tracked and located even if the GPS device has been jammed. The MicroTrac2 Radio Frequency (RF) Transmitter adds RF tracking capability to just about any GPS tracking system on the market. The MicroTrac transmitter is installed within the enclosure of your existing GPS tracking unit. When a theft occurs, the transmitter is activated via a remote controlled output on your GPS device or via a GPS Jamming detection output if available. The MicroTrac Transmitter broadcasts a powerful RF tracking signal that can then be tracked from several miles away using our PT-SC1 Mobile Tracking Receiver, and will lead you to the exact location of your stolen vehicle or asset. The MicroTrac Transmitter’s small size will usually allow it to be installed within the enclosure of GPS unit that you are already using to provide tracking services. 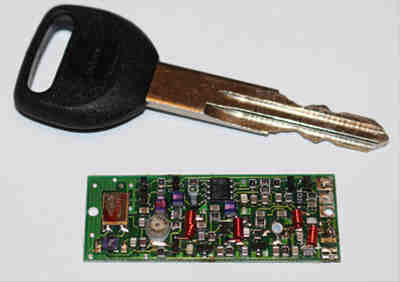 It is connected directly to the GPS unit’s circuit board using double stick tape and two wires. The transmitter will not draw any power until activated, making it ideal for self-powered GPS trackers. The positive power connection of the MicroTrac will connect directly to a positive power source within the GPS unit. The negative (ground) connection of the MicroTrac will connect to an active-low output of the GPS device. This output must be capable of sinking a minimum of 60mA of current. When this output goes to ground, the MicroTrac will be powered on and begin transmitting its signal. The MicroTrac Transmitter is priced between USD $40.00 and $50.00 per unit depending on order quantity. Various optional backup batteries are also available. The Pegasus PT-SC1 Mobile Tracking Receiver, pictured above, is used to track the MicroTrac Transmitter. This unit is priced at $1000. A hand-held tracking receiver is also available for tracking on foot and indoors.